The NEC SL1100 Digital System Kit (1100009) offers everything you need to manage the day-to-day operations of your small business. The main SL1100 Key Service Unit has 8 Digital and 4 Analog line ports with expansion capabilities. Six Digital 24-Button black telephones (1100063) are included with 9 fixed feature keys and navigation keys with programmable LED keys. 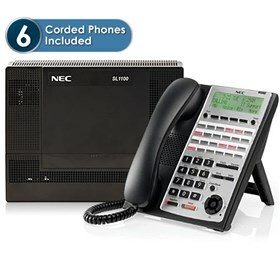 The 24 button telephone has these unique features include energy saving sleep mode, built-in wall mounting, and an innovative two position angle adjustment. The full duplex speakerphone gives clear sound for handsfree usage. The NEC 1100009 has many exciting features for users of all types. You can extend the lifetime of your NEC 1100009 with the purchase of a FactoryOutletStore Factory Protection Plan. The NEC 1100009 is sold as a Brand New Unopened Item.